Camouflage is defined as the use of any combinations, materials, coloration, or illumination for the purpose of either making animals or objects harder to see or by disguising them as something else. The ability of the googly eyed stubby squid of activating a mucus jacket allows sand, pebbles and other sediments to stick to them creating a new layer of camouflage which confuses the predator by making them sometimes visible but momentarily harder to locate. This trait is what makes this animals such great hunters and it also helps them by increasing its chances of survival. This squid was not know about before the video. According to The Telegraph newspaper page, this creature is more related to a cuttlefish than a squid. Cuttlefish is a gathering of marine mollusks within the Class Cephalopoda. Squids are cephalopods which are fit in with the Order of Teuthida. Some cuttlefish species have outside shells, yet squids have an interior bone-like structure called pen. Every squid can be called a Cuttlefish, but not every cuttlefish could be a squid. Octopi, squids, & cuttlefish are remarkable animals. They are smart—challenging the notion that only vertebrates like ourselves can be smart. The googly eyed stubby squid is also called Rossia Pacifica and it is native to the northern Pacific Ocean. This squid is closely related to the cuttlefish, although it resembles both an octupus and a squid. According to the Time article, the newly discovered squid lives for two years and both male and female die after mating. Finally, it is interesting how it can form a large protective “jacket” of mucus around itself for camouflage. This creature was found by a group of researchers in a ship called Nautilus while searching the sea floor on California Coast about 3,000 feet below the surface. 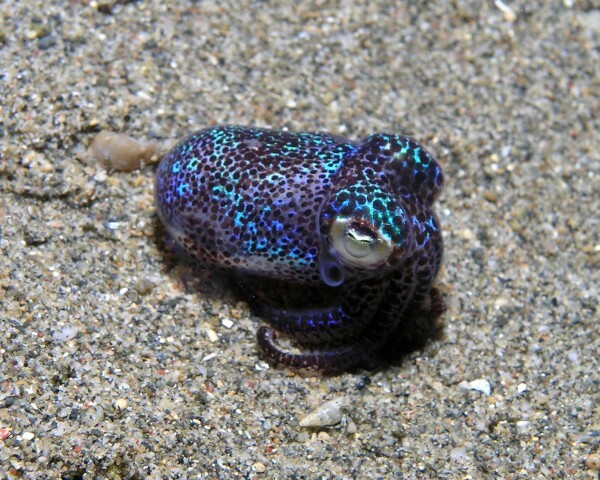 It is also known with the name of “Rossia Pacifica” and as Bobtail squid, and its naturally found in the Northern Pacific Ocean. It’s said that this animal is not that strange and its not truly a squid, but it’s a close relative to a squid. His big and funny eyes are helpful when it comes to it’s dark or scarce of light environment because those big eyes help’s the animal gather as much life possible, making it easier to spot food or predators. This first link helped with the information from this cute little guy and the second links is a YouTube video showing this same creature in movement. We know very little about our brains. If we want to understand human brain function, the cephalopod brain could tell us a lot about the origin of consciousness. The Googly-eyed Stubby Squid (Rossia pacifica) is such a remarkable marine animal. Octopi and squids being one of my favorite species, I find it to be such an amazing small creature (up to 3cm big). I am so intrigued by the aspect of camouflage and how they use it as an efficient way to dupe and obtain prey, or to hide from predators. It certainly is the best way for them to do so, since they live most of their lives on the sea floor at least 300m below the surface. These beautiful creatures only live up to approximately 2 years. This interesting animal is the perfect example of “don’t judge a book by its cover”, since it is seems so harmless, but isn’t because of its camouflage abilities and survival skills. That googly eyed squid really is a charm with its cute little size and googly eyes, but i wonder if it has any adaptation to survive. The purple color and big eyes don’t help him to hide well so i wonder what other adaptations it could have. An adaptation that it could have would be camouflage since that’s what most cuttlefish have as a defense but it cant be seen. Nonetheless the fact that it lives so deep in the ocean is a pretty good feat. Speaking of cuttlefish and their camouflaging capabilities i found a video of how advanced cuttlefish can camouflage to anything that a scientist placed a cuttlefish on black and white kitchen tiles and it could change! Here’s the link. Like most of my colleagues when i first saw the video not only did i think it was fake but i thought it was a prank. Who would have ever thought that an animal much like this one would ever exist if it were not for some sort of drawing or a kids movie. This goofy, and even childish looking squid makes me think of Hank, the squid from Finding Dory, it looks like it was made for kids. It kind of takes you back to your childhood and even makes you happy and laugh to see an almost cartoon like animal be real. It makes you wonder if we found one animal like this, could there be others in the world? And if so, where can we find them and why havent we yet? The googly-eyed stubby squid is absolutely adorable. It’s big eyes and purple color make it look like a stuffed animal. What really caught my attention was that the squid was a very shocking, purple color, which, compared to its surroundings, really makes it stand out, but I find it incredible that the squid has adapted to that disadvantage by covering itself in mucus, which causes stuff on the ocean floor to stick to it, which leaves it completely unnoticeable. From its big eyes, you can guess that this animal has excellent eye sight, even in the dark. Big eyes is a common thing among cephalopods, which include octupuses, sea slugs, cuttlefish and squids, and the ability to change color is another well known trait among this group. I’m also very impressed at how smart this animals are. I found this website that explains how the cells and organs found in the skin of cephalopods help them camouflage. What an interesting creature! Did you know that even though it looks harmless, this little cethalopod is considered a fierce deep-sea predator? Cethalopod expert, Michael Vecchione,said that the “Rossia pacifica” is not an unusual species, actually ranging from scuba diving depths to deeper waters. Vecchione also said that, as for the eyes, they are pretty normal in deep-sea animals because of the scarce light. They come in handy when looking for food or a safe spot from predators. It truly is amazing how there are a lot of creatures being found and all of the creatures that are left to find. This creature is remarkably interesting, its toon-like eyes made me believe it was fake. He uses his camouflage to keep predators away. Camouflage is the adaptation of an organism which enables him to “hide” from his predator and sometimes can be used to attack. The googly eyed squid uses a mucus like substance causing sand and pebbles to create a layer of camouflage for the squid. Learning about a this new and interesting organism is fascinating. This site describes in more detail this organism. The googly eyed stubby squid uses a powerful tool called camouflage in his advantage to confuse his prey and predator. His physical attributes makes him look as if he is fake but its his ability to camouflage and how he looks that helps him survive in the dangerous marine life. This is a remarkable organism that takes advantage of his abilities to survive. I find its very interesting to discover these type of organisms who are small and maybe unnoticeable but we humans have many things to learn from them. Here is more information regarding the googly eyed stubby squid. This “stubby squid” is, in fact, a Rossia Pacifica lying in wait for prey. They are actually nocturnal predators, so they are usually burrowed in the sand of the ocean floor, leaving their eyes poked out. Also, they activate a sticky mucus jacket in order to camouflage. In this website, I found interesting information about this species. The googly eyed stubby squid looks very harmless, but actually he belongs to a family cephalopods which are fierceful predators. They can attack easily because they stay at deep oceans and camouflage or even hide under the ocean floor. With their big and potent eyes they observe carefully their surroundings. This googly eyed squid reminded me of Zoidberg from Futurama because its tentacles originated from the organisms face. Its fascinating how these deep sea creatures find their ways to live and hunt in the absence of light. Definitely the squid’s eyes play an important role in its life because with such proportions it will facilitate the organism to hunt and sense predators more sharply. Another important aspect is camouflage, it is the first time I heard an organism releases mucus to attract the surrounding parts and use them as a cloak for it to blend in its environment. We should never underestimate an organism by a funny appearance, instead analyse how its anatomy helps the creature survive in this competitive and complex ecosystem. The link below will help you guys understand this organism in a more detailed way and help you identify between a squid, octopus, and a sepiolid.